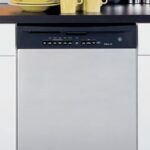 Despite the magic it performs in the kitchen, a dishwasher is actually quite simple—it is essentially a watertight box that sprays dishes with hot water and soap, drains out the dirty water, and then dries the dishes. All of this is operated by controls that may be very simple or quite complex. The controls tell the system when to spray, when to release detergent from a dispenser, when to extract water from the tub and pump it back through the system, when to rinse and remove the rinse water, and when to turn on the heating element. 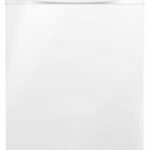 Hot water is delivered to the interior of a dishwasher through a supply hose that connects to a water supply valve, typically mounted under the sink. To shut off the water to the dishwasher, you close this valve. The other end of the supply hose connects to a water inlet valve inside the dishwasher. The inlet valve, electronically connected to the controls, opens and closes to supply water to spinning spray arms. 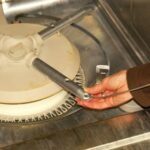 These spray arms, usually at both the top and bottom of the tub, are like a high-pressure sprinkler system that sprays the dishes clean. Dirty water collects at the base of the interior chamber, moves through a filter, and is pumped back through the system during the early wash cycles. When all of the cleaning and rinsing cycles are finished, the pump sends the dirty water out through a drainpipe. Then an electric heating element heats up to dry the dishes. Problems with proper cleaning usually arise if the water is not hot enough (140 degrees F. is optimal) or if your water is too hard. How hard is your water? See How to Test for Hard Water. Also, when operating your dishwasher, use the right amount of soap for your water type—1 teaspoon per grain of water hardness.